The typical life expectancy of a New York City restaurant is a mere seven years, but today, more than six decades after it opened, the facade of '21' is probably the most instantly recognizable of any restaurant in the world, and limousines line up virtually every night, dropping off and picking up celebrity diners. Although '21' has been immortalized on film, in photographs, drawings, and print, there has never before been a '21' cookbook. Happily, that oversight has now been rectified, and with this book people everywhere, whether or not they have ever dined at '21,' will be able to bring a bit of its fabled glamour, and much of its justifiably renowned cuisine, into their own homes. Michael Lomonaco, the executive chef, is a celebrity in his own right. Having garnered rave reviews from such hard-to-please critics as Gael Greene (New York magazine), John Mariani (Travel & Leisure), and Andy Birsh (Gourmet), he has appeared with Julia Child in her "Master Chefs" series, on both David Letterman shows, and on "Today" with Katie Couric. The '21' Cookbook contains well over 150 recipes for dishes ranging from the world-famous '21' Burger and Traditional Crab Cakes to many of Michael Lomonaco's innovative ways with grains, fish, and the game for which '21' has always been renowned. And liberally sprinkled throughout are fascinating stories about the restaurant's history, the legends that have grown up around it, and, of course, the many celebrities who have dined there over the years--all illustrated with photographs, cartoons, drawings, and other '21' memorabilia. 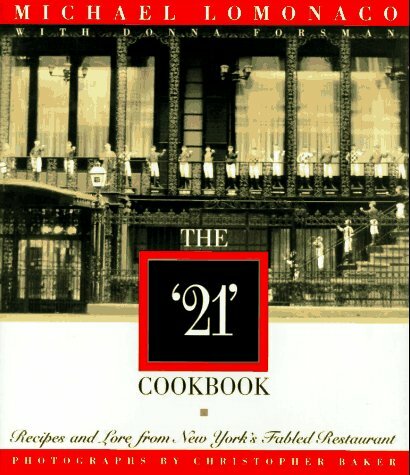 In short, simply reading The '21' Cookbook is to partake of a feast nearly as opulent as a visit to '21' itself. "Michael Lomonaco has combined his classic training with an infectious enthusiasm and a relentless passion for his metier. True knowledge and unmitigated imagination equal greatness in the kitchen." "Can it truly be that a New York institution-to-the-powerful actually serves exciting food and warm hospitality? Thanks to Michael Lomonaco, the '21' Club does just that. The beef, fowl, and game recipes alone are a must for any red wine lover." The First World War (the Great War, as they called it then) changed attitudes and lifestyles in America almost as profoundly as it changed the geography of Europe. Hemlines were up. Inhibitions were down. Within two years of war's end, a new decade was ready to roar. The '20s version of the Moral Majority, however, had other ideas. The Eighteenth Amendment, known then as the Volstead Act, became the law of the land on January 17, 1920. Prohibition, which was supposed to end drunkenness, debauchery, and corruption, promptly made law-breakers of millions of people. Estimates of the number of illegal drinking establishments that sprang up in New York City alone was as high as 32,000--more than twice the number of legal pre-Prohibition drinking places. Overnight fortunes were made by catering to this insatiable thirst, a fact not lost on cousins Jack Kriendler and Charlie Berns, two collegians who were struggling to make ends meet. Their first speakeasy, The Red Head, sold dollar flasks that customers hid in their coat pockets or poured into teacups, the source of the speakeasy nickname "cup joint." But the atmosphere at Jack and Charlie's had little in common with either a tearoom or the average gin mill. Instead, it felt like one big fraternity party, with live music, gay blades, and liberated flappers doing the Black Bottom and Charleston. The clubby feeling at each of the "speaks" Jack and Charlie ran before finding their permanent home at 21 West 52nd Street was no fluke. Jack made a conscious effort to "recruit" customers from the Ivy League colleges and to create an environment where the sons of America's first families would feel at home. Prices were stratospheric right from the start. But customers got full measure for what they paid. No rotgut hootch. No bathtub gin. Jack and Charlie went directly to Europe and made arrangements to have the likes of Ballantine's Scotch and Hine Cognac smuggled in. They even hired Kaiser Wilhelm's former chef to run the kitchen. It wasn't only undergraduates who rose to the bait. Writers, artists, movie stars, and adventurers quickly staked claim to the red-and-white-check-clothed tables in Jack and Charlie's barroom. Robert Ruark, Frank Buck, John Steinbeck, and Ernest Hemingway swapped tales about the ones that got away. Joan Crawford, Cary Grant, and Myrna Loy commuted from the coast. '21's famous hidden wine cellar--never penetrated by Revenue agents--was one of former New York Mayor James "Gentleman Jim" Walker's favorite spots for clandestine evenings with his mistress. It was at '21's front door that Clare Boothe Luce reportedly offered to step aside for Dorothy Parker, saying "age before beauty," to which Parker responded, over her shoulder, "pearls before swine." Another evening, humorist Robert Benchley, after closing the bar as he often did, hailed a man in uniform out front: "Call me a cab," instructed Benchley. To which the man replied: "Sir, I am an admiral." "Fine, then call me a battleship," Benchley retorted. This is a classic open-face bar burger, a carnivore's delight. Allow extra grilling time for this outsize knife-and-fork burger. The combination of two different beef cuts produces a flavorful juicy burger. Resist the temptation to press the burgers with a spatula while they are on the grill. I always tell my new grill cooks, "Press pants, not burgers." Pressing on a burger makes a big show, with flames flying, but it also makes a dried-out burger because you press out all its juiciness. Handle the ground beef as briefly as possible--in other words, don't "knead" the meat--because over-handling changes its texture, moistness, and flavor. Using your bare hands, shape the meat firmly into 4 round, uniform patties about 1-1/2 inches thick. Brush both sides of the burgers lightly with olive oil and sprinkle with salt and pepper. Brush the grill lightly with olive oil and grill the burgers over a medium flame until done to your preference (about 5 to 6 minutes on each sides for medium rare, 7 to 8 minutes on each side for medium, and 9 to 10 minutes on each side for well done). Meanwhile, add the dried thyme to the 1/4 cup olive oil. Brush the bread, tomato, and onion slices with the thyme oil. Salt and pepper the tomato and onion slices. Place the bread, onion, and tomato on the grill, and grill lightly on both sides. Place the grilled bread on a warm plate, top with the onion, tomato, and finished burger. Serve with French Fries and '21' Serious Steak Sauce (available in gourmet food stores or by mail from the '21' Club). To make french fries, use the large blade on your mandolin or vegetable slicer. Heat the vegetable oil in a deep-fryer to at least 240deg. but no more than 260deg.. (For successful french fries, I strongly recommend using a thermostatically controlled electric deep-fat fryer rather than attempting stovetop frying.) Add to the hot oil a handful of potatoes at a time, so that you don't decrease the temperature of the oil dramatically or crowd the pot. Cook approximately 3 to 4 minutes. Remove and shake off excess oil. Place on paper towels to drain. At this point, the blanched potatoes are ready for their final frying, or they can be cooled and refrigerated several hours. For the final frying, increase the heat of the fryer to 350deg. to 360deg., add the blanched potatoes a handful at a time, and deep-fry until golden brown and crisp. Remove to paper towels to drain, and salt lightly while still hot. Serve immediately. Chef's Tip: The key to avoiding soggy fries is to fry them twice, first at 240deg., then at 360deg..